Imagine a pre-workout tailored perfectly to your needs. 100% effective, super cost-efficient, and it does all the things you want – with none of the fluff or marketing hype – all at a great price. 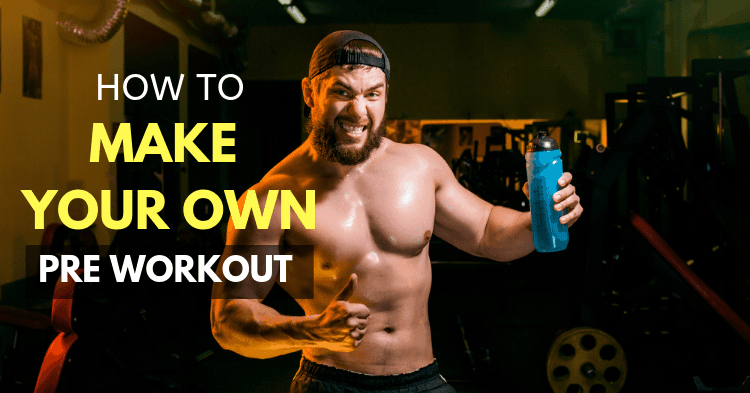 That’s what we’re going to be talking about today: how to make your own pre-workout supplement, why you should be creating a custom pre workout, and some advice on how to make the most of it! Why Make your Own Pre-Workout? The Challenges of Making Your Custom Pre-Workout? How Do You Make Your Homemade Pre-Workout? Do I Need to Cycle My Pre-Workout? Control over your own pre-workout is going to be crucial. The biggest benefit is being able to pick ingredients for yourself – the supplement industry has some “filler” products and you can cut those out. This means you’re going to be paying for what you want – the things that help your goals – rather than some cutting-edge version of an ingredient you don’t care about. This means more of what you want, less of what you don’t, and paying for what you need. We’ve mentioned already that you’re paying for what you use, and this obviously means that you get to cut costs if you make your own pre-workout. The vast majority of ingredients are inexpensive, and you usually end up paying through the nose for pre-workouts because of the cost of marketing or to line somebody else’s pockets. When you’re making your own pre workout supplement, you’ll be able to save money without missing out on the things you want. Control isn’t just on what you put into a custom pre-workout – it’s about how much. Many pre-workouts hide behind proprietary blends so that they can go heavy on the cheap fillers and provide less of the expensive active ingredients. When you’re building a custom pre-workout, you get to select the dosage based on your priorities. You can ramp up specific compounds to meet your goals, while others are only included for additional benefits or to add a bonus. This level of control is great in an industry that has a bad reputation for selling a lot of ineffective products. When you make your own pre-workout, you can be certain that you’re not getting short-changed on the stuff that matters. Despite all the benefits, it’s not all rosy for making your own pre-workout supplements. The first one is that you actually need to know what you’re going to be using. You need to know what your goals are and what you need to achieve them: you can’t put creatine in without knowing what it’s for. This takes a little research. Secondly, there’s a lot more effort involved. You get a much better product at a better price, but if you’re strapped for time and don’t mind paying a little more, there is less effort involved in buying pre-made pre-workouts. Finally, you may have a few reservations about the taste of a custom pre-workout. Say what you want about the many questionable products out there, but they’re designed to taste at least moderately-pleasant. Since you’re designing your own, you’re probably going to want to drink it from a juice or other flavored drink, since it’s probably not going to taste great. This isn’t a huge deal, but these 3 challenges add up and it’s not hard to see why there are companies out there formulating pre-workouts for you. The real difference is that making your own pre-workout means a big time and effort investment. If making your own pre-workout takes time, effort, and knowledge, we’re here to save you a little of each. We’re going to cover the basics of making your own pre-workout. This is key – you need to know what you want to achieve from your workouts. The point of making your own pre-workout is to provide yourself with all the best ingredients. If you’re not tailoring a custom pre-workout to your own workout style, you’re missing out on serious gains. Your training is specific to your goals and your supplements should be, too! Caffeine is key for any pre-workout to promote wakefulness, focus, and improve power output. It’s got great benefits to metabolism and it has even been shown to improve endurance. With a variety of positive effects, it’s no wonder caffeine is the foundation of the vast majority of pre-workout supplements. If you’re able to, it should be included between 150mg and 500mg. Any more can be unhealthy at once, while any less has not been shown to have the key benefits we mentioned above. Staying within this range means staying safe, but you also have to consider your total caffeine intake. This includes your pre-workout, but also your morning cup of joe and any sports drinks you consume through the day. Too much can be a concern – more is not better, especially when consuming too much caffeine can lead to diarrhea and digestive discomfort. If this is your first time, it’s safer to use caffeine capsules – which are sold at 200mg each – and just open them into your pre-workout with scissors. This means a reliable amount, and far less risk of consuming too much caffeine. If you don’t respond to caffeine, there are caffeine-free alternatives on the market and you can learn more about those to help you build your pre-workout. If you want a great workout – and a great custom pre-workout supplement – carbs are a good choice. There are lots of myths about carbs, but one thing that is true is that carbs boost your workout performance. They reduce mental fatigue, improve power output, and too few carbs in your diet can even limit the amount of muscle you’re able to build! Cyclic dextrin is the best choice for this kind of carbohydrate, since it provides a more reliable and consistent-release formula. It’ll get into your bloodstream quickly, providing you with the fuel you need for those intense workouts. Creatine is essential for strength and muscle gains. It’s a compound known for its boosts to strength by increasing the high-energy fuel in your muscles. This means stronger lifts and longer sets. It also boosts the hydration and volume of your cells, which can boost muscle growth and keeps them healthy. On top of the strength and size gains, it also improves endurance performance and benefits to both heart health and reduced cancer risk. Win-win. Creatine is widely available so you can get it relatively cheaply, but aim for a high-purity product that doesn’t rely on secondary ingredients. The more extra stuff, the more you’re going to pay. Citrulline Malate can help boost your pump, which indirectly boosts your ability to gain muscle. This makes Citrulline a prime candidate. Citrulline is much the same as creatine for your buying options: find something simple and pure, that doesn’t have you paying extra for stuff you’re not going to use, or that might already be in your pre-workout formula! Beta-alanine is the #1 place to start for endurance. Beta-alanine reduces the onset of fatigue, helps you recover between sets, and boosts your mental ability to deal with training. Reducing the amount of soreness during exercise and extending your time to exhaustion. This means being able to run, row or cycle for longer without giving up. Reducing the odds and severity of muscle damage by removing waste products. These are key for anyone looking to boost performance in longer cardio exercise. It’s available in large bags relatively cheaply, so you’re going to be able to get plenty of the raw beta-alanine powder for your pre-workout. The first is to purchase the specific ingredients at low costs and unflavoured. These can then be mixed together and blended with a product that has a flavor – like a juice or even a juice powder like Kool-Aid or other delicious powders. This obviously means you’re involved in a much larger amount of individual effort for finding, buying, and mixing products. This also means measuring out the specific concentration and other factors yourself, rather than having them figured out in advance. This can be very cost-effective on a serving by serving basis: individual powders for creatine, citrulline, beta-alanine, and caffeine can be purchased for $10-15 and will provide far more servings than a pre-made supplement of the same concentration or size. This also means being very careful not to overdose or under dose specific ingredients. Keep your eye on the caffeine intake specifically, since this is the ingredient with the most obvious, acute side-effects (like diarrhea and discomfort) when mixed poorly. There are millions of combinations of ingredients for every different goal, so we’re going to show off 3 of our favorite recipes for different DIY Pre-workouts. These simple, effective mixtures will maximize effects with effective ingredients for each goal. The combinations are sometimes as important as the actual ingredients, so these are perfectly well-balanced. Remember: always consult your medical professional if you have any pre-conditions or concerns about supplements! This is a simple recipe for a pre-workout supplement that maximizes size, strength and recovery. It aims to provide you with the best long-term boosts to workout performance, pushing your athleticism and progress to the next level. It’s important to take the same detailed approach to endurance that you’d take to muscle building or strength. Nutrition is equally important for both, even if it requires different products and a different focus. Carbs: again, 5-20g of carbs per serving will be great to support your endurance goals and fuel your muscles. This is a general pre-workout supplement for the general gym enthusiast. It might not be quite as specific, but it provides the most important ingredients for overall health, wellbeing and performance. This also makes for an effective pre-workout for CrossFit – something we’ve talked about extensively before! Carbs: if you hadn’t noticed yet, they’re great workout-fuel whatever your goals! There are a few pro tips you’re going to want to incorporate for the best results, even when you’re making your own pre-workout. We recommend taking your pre-workout 30-60 minutes before your heaviest sets. This doesn’t mean 60 minutes before you get to the gym. Caffeine peaks at 60 minutes after drinking, while things like citrulline tend to take 45 minutes. Getting these into your body should be timed based on the toughest exercises and sets in your workout – you don’t need to get hype for your warm-ups! Endurance-based pre-workouts are slightly less of a concern since you’re not worrying about instantaneous performance. The mental focus of caffeine slowly drifts away over 6 hours, so you’re not going to be struggling to time your pre-workout. You develop a resistance to caffeine over time, so you can benefit from taking a few days to a week off after 4-8 weeks. This isn’t necessary, however. You’ll be able to get better results for taking time off since other compounds – like beta-alanine – also reduce their effectiveness over time. You have a trade-off with cycling pre-workout: you have to pick a week off or a slightly reduced effectiveness over time. This is going to depend on how much you lean on your pre-workout, and the timing. We recommend cycling your pre-workout off during scheduled Deloading weeks, when training is lighter anyway and you don’t need the big boost, to keep yourself performing at your limit. This also means taking time off of other caffeine sources – your pre-workout might not be the only place you need to make changes if you’re drinking 10 cups of coffee a day! Making your own pre-workout is a great way to avoid some of the pitfalls we see with low-quality products. There are a lot of questionable pre-workouts on the market, which leaves a big gap for a pre-workout that you have control over. There are services available for this sort of thing and mixing your own pre-workout comes with a few significant challenges. Overall, it’s a great way of getting the most out of your supplementation if you’re willing to put in the time and know-how to make it safely. We’ve taken you through some of the basics of making a good pre-workout for yourself, but the decision on what to do – and what to include – is up to you and your goals. We recommend double-checking your effective doses and being careful.